The refrigerant charging scale is ideal for HVAC and refrigeration service, including the critical charging of small refrigeration systems. This Refrigerant Charge Scale offers the highest accuracy of +/-0.25oz.(5grams. ), delivering dependability to get the job done right. The slip resistant platform handles all types of refrigerant cylinders with ease. It's really an ideal tool for recharging and recovering all types of refrigerants. 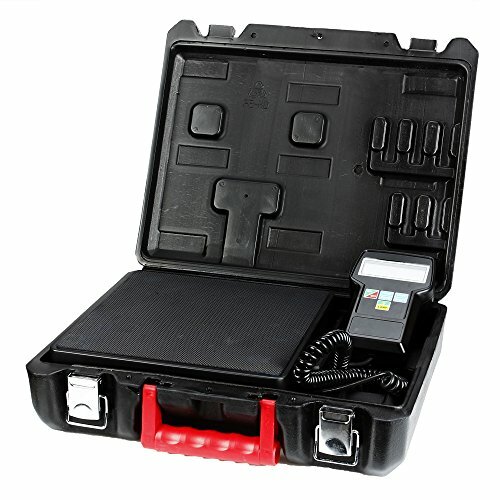 Capacity: 220LB/100KGAccuracy: +/- 0.5% of readingResolution: 5g /0.010lbs/0.25ozPower: 9V DCUnit: LB/KG/OZOperation temperature: 32 F to 113 F (0 C to 45 C)Non Slip Platform size: 9" x 9"Overall dimension: 9" x 9" x 1 1/2"